I love the technology industry. It is a really great area to write about, as it is constantly changing. Every day, new technologies and methods are developed and released and there is always something interesting to research. One thing that I do wonder about though, is the consumers constant need for updates. Take the iPhone for example. You can now walk around with a smartphone sat-nav and a global dictionary in your pocket thanks to Apple’s incredible device. There is no doubt that the iPhone is an example of how technology is constantly evolving and changing. Since mid 2007 when the iPhone was released, there have been five different variations/upgrades of the device released. Six versions of ultimately the same device in the same number of years. Fair enough, each time their has been a technological upgrade, however can that really be justified? Technology is a constantly moving and evolving however I am sceptical that consumers always get the best update. Apple want to sell phones right, so every year (there or thereabouts) they release a new iPhone. Samsung do the same, as do RIM (owner of Blackberry) and most other smartphone manufacturers. What I am not sure about is that every year there is a significant enough technological upgrade to warrant the release a new device. So how do Apple do it then? How do they roll out a new phone with ‘cutting edge’ new features every year? It is my belief that some of the technology in the iPhone 5 has been around for a good few number of years now, however Apple have just been holding back on releasing it, so that they can produce more future editions of the phone. Also, many of the changes are superficial. For example, the screen gets a little bigger, the camera gets an extra few mega-pixels, the storage options increase. All of these updates could have existed in the original iPhone, however it would have meant that there were fewer tweaks Apple could make to the phone in the future. Why not design a good phone now and not release another until there is enough new technology to justify it? 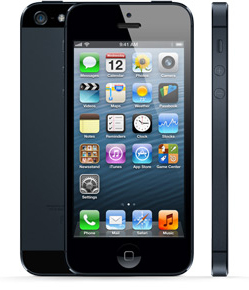 Within three days of the release of the iPhone 5, people around the world had bought over 5 million. Apple shares rose sharply, and the brand received a big boost. It was a great move by Apple, however are they not cheating the consumer? In around a year I expect Apple will release another iPhone, and most of the technology and developments that it will contain are probably already in existence and ready to use, however Apple will have decided not to put them in the latest iPhone, so that they have something to put in the next release. Would it not be better if Apple released an iPhone every three years? That way each phone could be a massive technological leap from the last, rather than just a slight upgrade. I think it would be better, the consumer would get the best technology available at the time, and wouldn’t have to worry about the device being outdated in a few months. But Apple would probably not see as many sales, over the three years, by releasing just one rather than three phones. What are your thoughts, are the big firms cheating us? Do we really need as many updates as often as we get them, or would bigger less frequent upgrades be better? They definitely held back 4G support. The chipsets were avaiable around the iPhone 4 time frame. Certainly for the 4S. Like you I suspect a bit of planned obsolescence. I think a lot is down to marketing, especially in Apple’s case who could probably sell ice to the Eskimos! What it comes down to is the money! When a business can make the most money for whatever product and than draw on a loyal customer base. Why wouldn’t they do some of what your talking about!?! I look forward to seeing the self drive car systems develop. Personally I enjoy driving, but I can see the benefits of not needing to be alert and focused 100% on the road all the time. Maybe an ‘autopilot’ mode for dual carriageways and motorways would be useful that you can then turn off when you leave them for a more minor road. Anyhow, thanks for adding your view, and welcome to the Technology Bloggers community! Interesting view Phil. I am not sure that they can make a phone that never needs to be charged, but I would agree that big firms do like to hold back updates for the future. I do agree with you that it would be better to release a new model with significant technological updates every 3 or 4 years, that way even the consumer would have enough time to make the most of the current model and replace it with the new model only when he is lured by the new technology. Careful Aaron, a good comment then you almost got deleted for spam. If you want to put your URL in the website field fine with us. Claim dofollow keyword backlinks, but don’t advertise your product in the comment itself. Great post Christopher! I definitely agree that thanks to technology, everyday life has become easier. But the constant updates and new releases are becoming too much! As you said, a few tweaks in the features here and there does not justify the release of a new smartphone. I remember watching something online where the journalist was asking passersby what they thought of the new iPhone 5 (while holding an iPhone 4 and making them believe it was the 5). People couldn’t even distinguish the two! Mobile phones are just an example of pure consumerism. I’m totally for bigger and less frequent upgrades. Question for you: do you have a smartphone? If so what make and version? Guilty as charged, I do have a smartphone, an iPhone 4 and upgraded from a Nokia. I do appreciate its functionalities but in no way will I upgrade my mobile phone just for the sake of having ‘the latest thing’. Before, people used to buy something and use it till it broke, not just because it was out of style. Of course, I am not trying to put everyone in the same basket but for a lot of people, it seems to be the case.